I think I mentioned a year ago that my boyfriend doesn't really like cake, which makes it a bit challenging trying to come up with something to make him on his Birthday. Last year I made him this cookie cake, so this year I needed to come up with something bigger and better. My thought process went like this, he likes brownies, he likes cookies, he likes slutty brownies... SLUTTY BROWNIE CAKE. 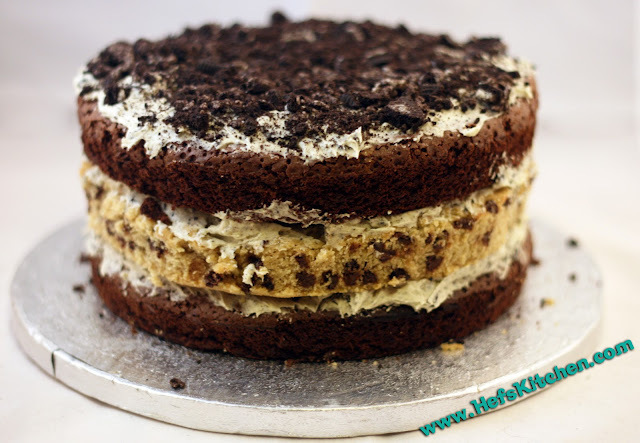 So to make it deliciously bad I wanted it to have two layers of brownie cake, a giant cookie layer and Oreo frosting. The only problem is that Oreo's aren't vegetarian, but never fear! One of my lovely twitter followers has found a veggie version in Tesco! Preheat the oven to 190 degrees, and prepare 3 8 inch cake tins by lining the bottoms with greaseproof paper. To make the brownie layers, melt the chocolate and butter in a bain marie. While the chocolate and butter mixture is melting whisk the eggs and sugar together until it trebles in volume, sieve the flour and cocoa powder in and then pour the melted chocolate and butter in and give it a good old mix until it's all combined. Spread the brownie mixture evenly between 2 tins and pop in to the oven for 30 minutes. While that's in the oven make up your cookie dough according to the instructions, flatten it in to the third tin and pop in to the oven for 15 minutes or until it's golden brown on top. When all the layers are done pop them on the side and leave them to cool completely in their tins. Make the frosting by creaming the butter, icing sugar and milk together, then smash up the veggie Oreos in a bag with a rolling pin, (leaving 4 for the top) add them to the frosting mixture and mix well. Build your cake starting with one of the brownies, then frosting, then cookie, more frosting, then the other brownie and more frosting on the top just for good measure. Smash the last of the veggie Oreos up in to tiny pieces and sprinkle on top. I've often seen Oreos quoted in American cookbooks as not only being vegetarian, but vegan. Do they make UK ones to a different recipe? What is in them that isn't vegetarian? I've seen that they're vegan in America too, which is why it's so weird that they're not even veggie over here. You'd think they'd stick to the same recipe! According the the website they're not (http://www.oreo.eu/oreo/page?siteid=oreo-prd&locale=uken1&PagecRef=633#ans06) I think it's the whey powder in them.